First line: "Cole did have a map in his backpack. He'd studied it in the parking garage. Only now that he was already on the subway did it occur to him that it might be outdated." Three "hemovores" (don't call them vampires!) go on a road trip to teach the newest member of their ranks, young redneck Gordon, the finer points of how to survive. Johnny, the leader of the hemovores, runs a safe house for blood-drinkers in Manhattan and insists that Cole, who is quite a loner, take on the project of helping Gordon. Cole is accompanied by the light-hearted Sandor. Cole is tightly controlled, but events unfold to help him come to terms with his own unfortunate mistakes from when he was newly made. Sandor is light-hearted and jolly, and is accidentally responsible for having created Gordon after a mugging. Gordon is having enormous difficulty accepting and dealing with matters, longing to reconnect with his family and girlfriend, and has a lot of trouble seeing past his small-town hickish ways. The vampires - excuse me, hemovores, must avoid sunlight and must drink human blood. Typically, they are able to hypnotize their victims, and quickly draw a small amount of blood, enabling them to feed without killing. When being taught how to pick suitable targets, Cole and Sandor despair of ever making a proper hemovore of Gordon. Gordon insists on gravitating to cute girls, even when more likely targets are available and taking unnecessary risks. My favorite scene is when Sandor begs Cole to get Gordon a dog - to cheer him up, to make it easier to start small talk with humans (aka omnis), and of course, if he gets desperate, he can always eat the dog! There's a very dark and twisted humor at work here. 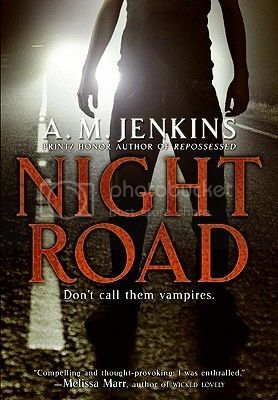 While I love a good series, Night Road is a stand-alone book, with a highly satisfying ending, but the door could easily be open for a sequel. The writing is tight, with well-thought out characters, pacing and plot. I enjoyed it enormously. I borrowed this book from the public library.